The Beech King Air B200, a higher performance model of the Beech King Air 200, features high performance engines and increased cabin pressurization. One of the fastest aircraft with a lengthy range, the King Air B200 quickly became one of the top jets in its class and now flies in over 100 countries worldwide. 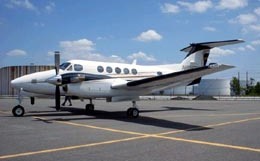 The Beechcraft Corporation introduced the King Air B200 in 1973, and the model received Federal Aviation Administration (FAA) certification later that year. Design features implemented in this private business jet include increased operating weights, a greater wingspan, and the introduction of the T-tail design now found on all larger King Air models. Design improvements found in the King Air B200 include an increased maximum pressure differential, improved performance specifications, and an updated flight deck layout. 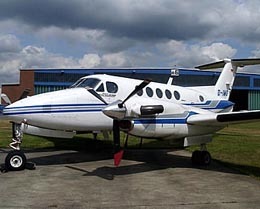 Production on the King Air B200 started in 1981 and ended in 2007. 2000 aircraft have been built so far. 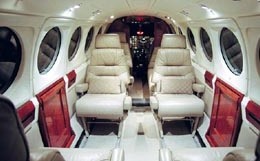 There are a variety of cabin configurations available for the King Air B200. The most common layout offers seating for eight passengers and features a club arrangement in addition to four individual seats. In a high-density configuration, this private business jet is capable of accommodating a maximum of fifteen passengers. The cabin of the King Air B200 measures 16.7 feet in length, reaches 4.8 feet in height, and stretches a maximum of 4.5 feet in width with a floor width of 4.1 feet. This private business jet features 55 cubic feet of baggage storage. Accessible in flight, this storage area is located in the aft cabin area and is capable of accommodating 350 pounds of luggage. With a maximum cabin pressure differential of 6.5 psi, the King Air B200 is capable of maintaining a sea level cabin altitude at an altitude of 15,293 feet. The King Air B200 comes equipped with two Pratt and Whitney Canada PT6A-42 turboprop engines. Each engine is flat-rated at 850 shaft horsepower. With these engines, this private business jet is capable of climbing to an altitude of 25,000 feet in just 16 minutes. The King Air B200 requires just 2,579 feet of runway to take off at sea level on a standard day. At an airport with an elevation of 5,000 feet, this takeoff requirement increases to 3,800 feet. With four passengers, the King Air B200 needs only 2,845 feet of runway to land. 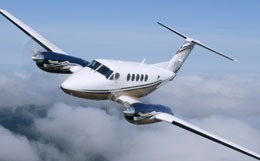 The King Air B200 features a maximum certificated service ceiling of 35,000 feet and a range of 407 nautical miles. 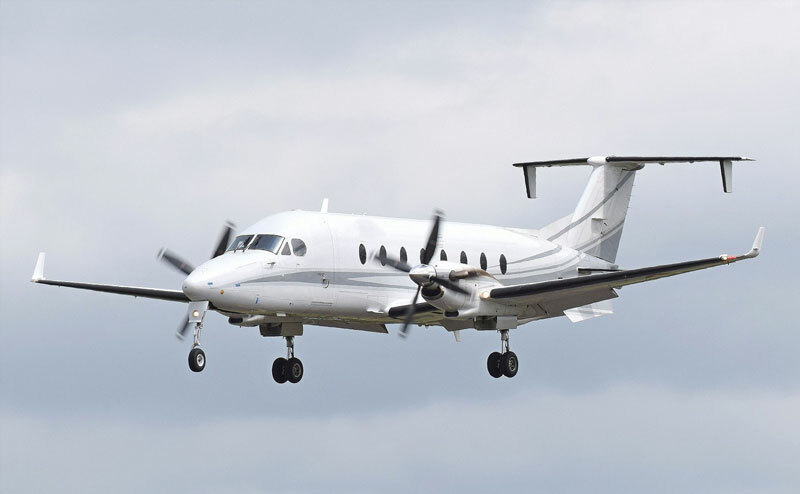 For a flight to a further destination, the King Air B200 is capable of maintaining an airspeed of 221 knots at an altitude of 29,000 feet in a long range cruise configuration. For a swifter flight, this private business jet is capable of maintaining an airspeed of 292 knots at an altitude of 22,000 feet in a high-speed cruise configuration. There are two main avionics options found in the King Air B200. The first features the two tube Collins EFIS-84, with the attitude display located above the navigation display. The second option features a five inch EFIS-85, which combines electronic attitude director indicators (EADIs) and electronic horizontal situation indicators (EHSIs) with a center multifunction display (MFD). Instrumentation implemented with these systems include an EFS 74 navigation display, a Collins WXR-840 color weather radar, and dual Collins Pro Line II communication, navigation, and ident radios with distance measuring equipment and dual glideslope. For more information about chartering, leasing or buying a King Air B200 please contact us by calling +44-20-3874-8091 or send us an email here.